You already know you have the option of publishing Verified Customer Reviews. 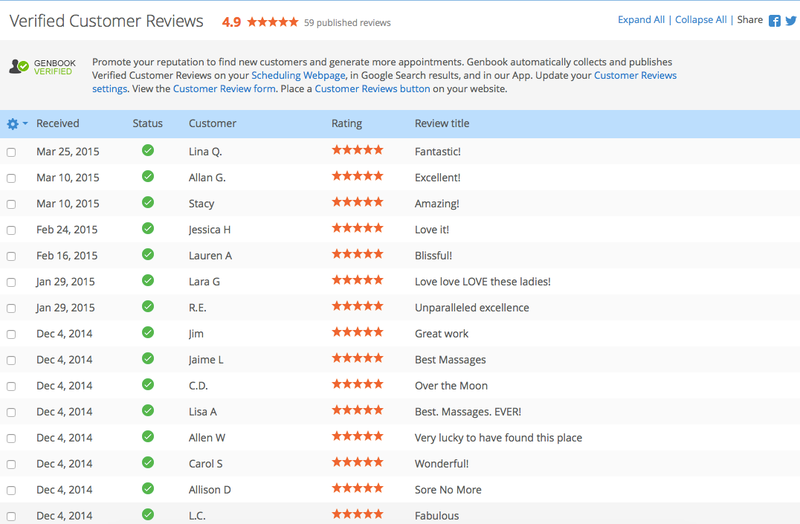 Now, here's a bit more about the Reviews tab, where you can see and manage all of your Genbook Verified Reviews. On the upper right, you'll see the option to preview the review form your customers are asked to fill out, so you can see what they see when being asked to provide feedback about their appointments. Just click on "Customer Review form" to see what they'll see. Here’s what the desktop/laptop version of the review form will look like. 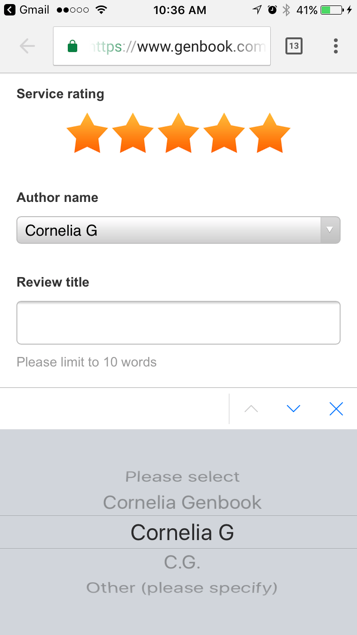 The review form is mobile-optimized, so customers will also be able to submit reviews from their smartphones. Whether they’re submitting reviews via a smartphone or computer, customers will have the option of associating their names (either the full name or first name and last initial) or choosing “Other” and entering a name they feel gives them more privacy. The level of detail clients give about themselves and their appointments is totally within their control when they create and submit their reviews. In the Reviews tab itself, to the left of “Received,” you’ll see a little dropdown menu that, when you’ve got a review selected (ie: the box next to a review checked), will give you several options of what to do with that review. As you can see, you have the option of publishing the review you selected (if the review were already published, then “Unpublish selected reviews” would be an option). You’re also able to choose whether you’d like new reviews your business receives to be published automatically, without giving you a chance to look at them. Many businesses choose to see their reviews before allowing them to be published. Manually publishing and unpublishing reviews can take a few minutes, so don’t worry if you see a “Pending Publication” status, after you’ve made a change on the desktop site. 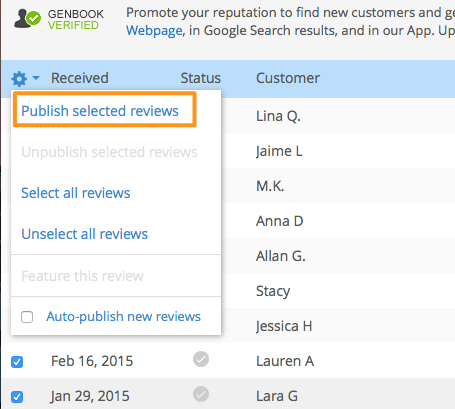 Reviews can also be published/unpublished from the Genbook Manager app. Because reviews are a great way to inspire confidence in your business, you should take advantage of the various options we offer for promoting your published reviews across the Web. You’ll find these options at the top right of the Reviews tab page. 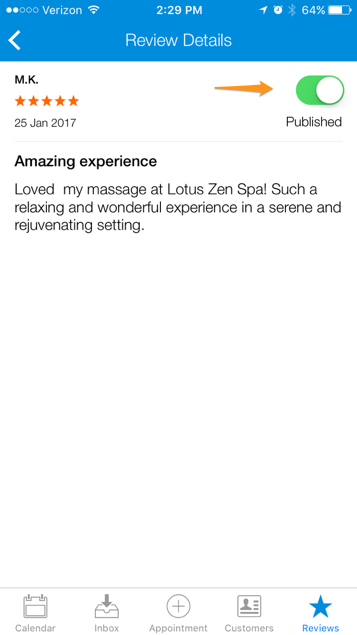 You can share your reviews via your Twitter feed, and on your personal Facebook profile and Business Page. You can even post a “Read Verified Customer Reviews” button on your website. In Settings, under the “Connecting” section, click “Reviews button”, then follow the instructions for adding the Reviews button (Tip: It’s just like adding the Book Now button to your site). 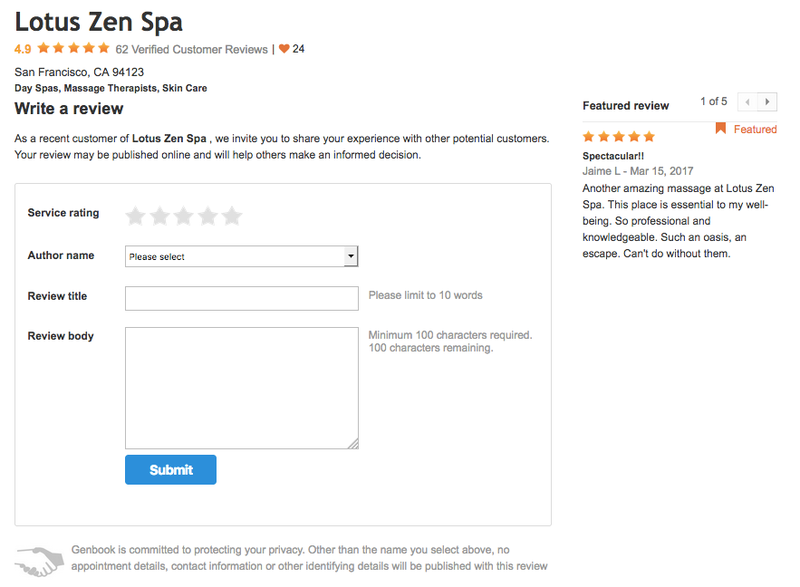 In the same way that the Book Now button takes clients directly to your online appointment scheduling page, the Reviews button will take them directly to your published Reviews page. 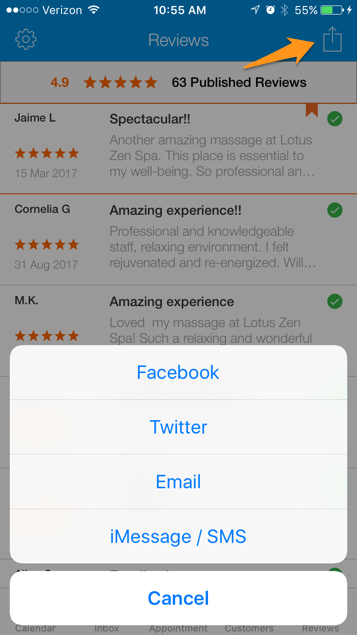 It’s also a good idea to share your reviews via social media, which you can do right from Genbook Manager.